WARNING! DANGER! Beware, Candy Addicts, there could be a sinister death-trap lurking in your pockets or purses, lying in wait of the opportunity to attack. It could rob you of your dignity, the use of your jaw, and apparently, all sense of reason. Yes, friends, I am talking about Starburst. Thank Goodness that Victoria MacArthur survived to tell her story. This brave Michigan woman bit into a lemon Starburst in 2005, and, according to this article, suffered tremendous injury. “Due to the negligence” of Mars, Inc., she “became ill, sore and lame.” She became so lame, in fact, that she had no choice but to litigate. On this Fox News segment, it’s captivating to listen to her story unfold. “Maybe about three chews, and it literally locked my jaw, and I had to *unhhh* to pull my jaw apart,” she said, gesturing to demonstrate how she must have forcefully tried to pry herself free of her sticky doom. Starburst has been known to just dissolve in people’s mouths, but she wasn’t about to leave anything up to fate. It’s also interesting to note her comment about serious, permanent damage to her ability to talk, chew, and sleep. “Those were my, those are my biggest complaints.” That must have been, I mean, must be permanently awful. 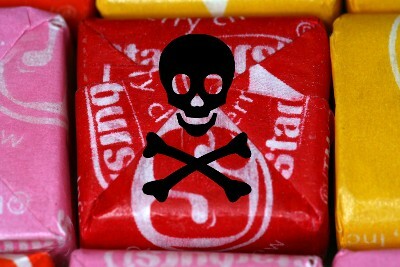 Besides the $25,000+ she’s seeking in damages, she wants to see Starburst put a label on their candies, warning of their dangerous chewiness. “I don’t want to see anyone else go through what I had to go through,” she said. Starburst Little Lad: Creepy or Cool? 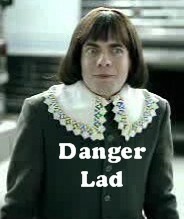 That Danger Lad picture is the greatest! Wow, I hope she never has Hi Chew then! I agree, great Lad pic too! Wow. This is almost as bad as the guy who wanted to sue a dry cleaner for something like $35 million because they lost his pants. Is this a class-action suit, I have had to “*uhhhnnngg-POP*” my jaw after biting and trying to chew a stale Starburst. If I had filings, they would have come out! If we all join in for a million, we could get a check for a couple pennies each, come on, guysâ€¦ lets go! I love the Starburst guy! He’s great. I love Starburst too. Yummy. I can unwrap a Starburst with a tongue cuz I’m cool like that. Someone give her a box of Jujubees to shut her mouth for good. Great Danger Lad pic. One time in high school I was sucking on a jolly rancher on the school bus and it was almost gone, and I chomped down on it and I couldn’t open my mouth again, I was scared but I just sucked on it until it was gone. I couldn’t talk for a a good 7 minutes though. Freaky but I wouldn’t of sued jolly rancher though. A chewy sweet could not have caused this.